Joe Navarro has spent a lifetime observing others. For 25 years, as a Special Agent for the FBI, he conducted and supervised interrogations of spies and other dangerous criminals, honing his mastery of nonverbal communication. After retiring from the bureau, he has become a renowned public speaker and consultant, an internationally bestselling author, and a sought-after TV commentator. ​Now, a decade after his groundbreaking book What Every BODY is Saying, Joe returns with his most ambitious work yet. THE DICTIONARY OF BODY LANGUAGE is the first-ever “field guide” to body language with more than 400 behaviors, presented in an easy-to-reference format that unveils what our bodies communicate about what we think, feel, want, desire, or fear. 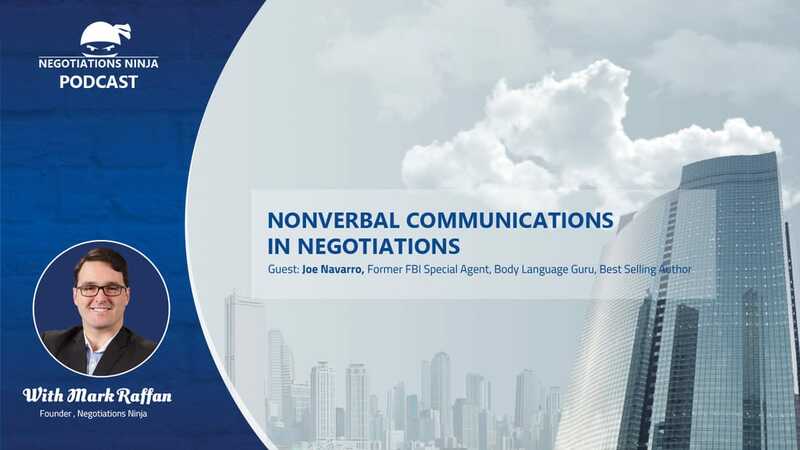 Joe and I had a great conversation about the power of body language and nonverbal communication in negotiations and how you can leverage nonverbal communications to get more of what you need out of your ongoing negotiations.